According to Dr. Ben Lynch, “Genes can be “born dirty” or merely “act dirty” in response to your environment, diet, or lifestyle—causing lifelong, life-threatening, and chronic health problems, including cardiovascular disease, hormone problems, autoimmune disorders, anxiety, depression, digestive issues, obesity, cancer, and diabetes.” And I just had to talk to him and find out more. Dana Trentini: “Your genes are not your destiny.” The idea that we have the power to turn off our genetic tendency to disease is fascinating. Our genes do not doom us to disorders that run in our families and that is empowering. It is good to have you at Hypothyroid Mom. Dr. Ben Lynch: When you look at the research, it continues to state that only a small percentage of diseases are caused by genetics. For example, causation of cancer by genetics is only about 1% – 5% with most research stating the lower percentages. Causation of Parkinson’s is about the same – only about 1% is associated to genes. Then there is the big Alzheimer’s gene APOE 4/4 and while this is associated with increased risk of Alzheimer’s, it is not a sure thing. In fact, research is now showing that even if one has the APOE 4/4, they may not have any signs of Alzheimer’s later in life because their lifestyle, diet, and environment have been excellent throughout their life. Dr. Perlmutter’s work on Alzheimer’s is demonstrating that the biggest risk appears to be abdominal fat. This is because abdominal fat is inflammatory and inflammation is at the core of most diseases. This means that despite your genes, if born dirty or not, are not deciding whether or not you’re going to get cancer, Parkinson’s or Alzheimer’s. Dana Trentini: How do our genes become dirty? Dr. Ben Lynch: What did your mother tell you to do often before sitting down to eat? Why? Because harmful bacteria and toxic chemicals are all over them. If you don’t wash your hands, you swallow the bacteria and chemicals. They get into your digestive system. From there, they get absorbed into your bloodstream and into your circulation. Your body recognizes these harmful bacteria and toxic chemicals as invaders and sends signals to your genes to get to work. Your genes get to work making enzymes which work to create compounds which kill the harmful bacteria and transform the toxic chemicals into less toxic chemicals. 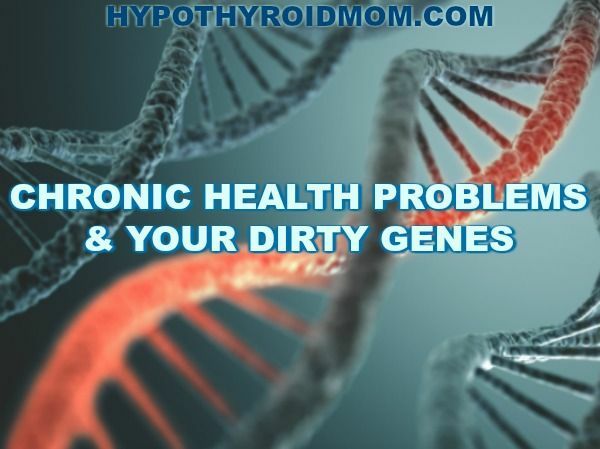 Dana Trentini: Let’s talk about some common health problems that can arise from dirty genes that I know will resonate with many of my readers. You have written about your intense reaction to certain chemicals and fumes and I had an “aha” moment. I get an immediate headache when I spend time with people wearing strong perfume, cologne, and even the scents of their moisturizer, makeup, hair shampoo, hair gel, or even underarm deodorant. I know this is a common problem that doesn’t get much attention. Dr. Ben Lynch: Great points and I hear you about people walking by off-gassing their noxious fumes onto you and overworking your detoxification genes. Since when did ‘clean’ have a smell? To me, clean is defined as the absence of smell. My pet peeve is scented dryer sheets. I’m now mandating a law in our home: kids with scented dryer sheet smelling clothes are no longer welcome in our home. Adults, too. Chemical sensitivity is both a cause and effect of dirty genes. Chemicals come into your body and cause certain genes to get to work such as the GST/GPX genes.. As you continue being exposed to chemicals, these genes start working overtime. What happens to you when you work overtime? You get tired. What happens to your performance? It goes down. How do you compensate? You ask for help or just stop working. Your genes are the same way. They work hard for you but your genes fatigue if you continue to overwork themas they run out of the vitamins and minerals they need in order to work. This is why periodic supplementation is so important. This is why avoidance of chemicals is essential. Dana Trentini: What about so many of us that find ourselves sensitive to one or more or even most foods? There are two types of genes which contribute to food sensitivities. ‘Born Dirty’ genes are genes one acquires from mom and dad at conception. These ‘born dirty’ genes are mutated which alters their function. ‘Got Dirty’ genes are genes which are born fully functional but got dirty from one’s choices around lifestyle, diet, environment, and mindset. ‘Got Dirty’ genes can also get dirty during embryological development. Your mother unknowingly may have been bathing you in phthalates, heavy metals, infections, heightened immune responses, inflammation and so on. Even if one acquires ‘born dirty’ genes which contribute to the above conditions, they can improve the function of these ‘born dirty’ genes and thereby reduce their symptoms. If one acquires these food sensitivity issues because the genes ‘got dirty’, they can clean them up. Dana Trentini: What about insomnia? Dr. Ben Lynch: Keep in mind that all problems we struggle with are due to dirty genes. This is an important concept to have sink in. It’s important to understand this as it empowers one to understand that they are in control of any symptom they get as they, themselves, through their own actions, can help clean up their dirty genes. There are a number of genes which contribute to insomnia. Let’s discuss three. If these genes are dirty, then insomnia is likely. These genes work on eliminating things which stimulate your brain thereby keeping you awake. Insomnia is not a condition really. It’s dirty genes. Your genes are not able to process the excitatory neurotransmitters as well as they should. COMT’s job is to process dopamine, norepinephrine and epinephrine – and estrogen. MAOA’s job is to process serotonin, norepinephrine, and epinephrine. DAO’s job is to process histamine. If any of these genes are working too slowly, then insomnia results. Dana Trentini: So this also applies to brain-related symptoms like brain fog, memory impairment, depression, anxiety, bipolar? Very rarely is one born with bipolar, schizophrenia, brain fog, or depression. These are all mostly acquired conditions. They are acquired because one’s genes got dirty. If one cleans up their genes, all these conditions should improve significantly. I have reversed all these same conditions with thousands of people. Dana Trentini: What are three things we can do right now to clean up our genes? Dr. Ben Lynch: There are so many things we can do – for free – to clean up our genes. The best way to clean up your genes is to limit the amount of work they need to do! Seriously. The harder they work, the more vitamins and minerals they consume and the more things they need to keep going. When I say avoid – I don’t just mean chemicals in the environment – such as scented dryer sheets (really bad for you!) or washing your hands after getting off a plane or playing soccer on turf. I also mean to avoid toxic relationships at work and at home. These must be fixed and often times the fix is being 100% honest with the other person. There are toxic ‘friendships’ to avoid as well. You know what I mean. We all grow and develop into changed individuals. Not everyone changes the same and that’s fine – just know that your best friend from 20 years ago may be really dirtying your genes now. It may be time to say we had a great time and move on. At work, you have to learn to avoid being the ‘go to’ person to get more work dumped onto you. Yes, you’re awesome at getting things done and reliable – but it’s not sustainable. Tell your boss or coworkers that you’re honored to be trusted in this capacity but it’s wearing you down. In order to stay reliable and trusted, you need to work within normal work hours and not be overwhelmed. I used to say ‘Yes’ to everything as I wanted to help. I noticed it was affecting my health, my productivity, my love for what I do and my family. Saying ‘no’ doesn’t mean you’re selfish and don’t care. It means that you know your limits and want to preserve yourself and your relationships that truly matter the most. Most of us do not breathe properly. Without air, you’re dead in 3-5 minutes. That’s fast. So obviously we need to focus on breathing but we don’t because it’s automatic. Close your mouth, breathe through your nose. If you cannot breathe through your nose, that’s the first thing you need to fix as breathing through your mouth is bad for your teeth, your gums, your cardiovascular system, your mood, your sleep and your energy. Please start focusing on your breathing. The more you chew your food, the less you will eat and the more nutrients you’ll absorb. You’ll save money, lose weight and feel better. Take time when you eat and eat when you eat – and only eat. Don’t work or drive or read or watch TV or listen to a podcast. Enjoy your food. When you chew your food, you’re providing your genes the nutrients they desperately rely on you to provide. If you provide your genes nutrients from food, you’ll feel better. Learn more steps to clean your genes in my book Dirty Genes.